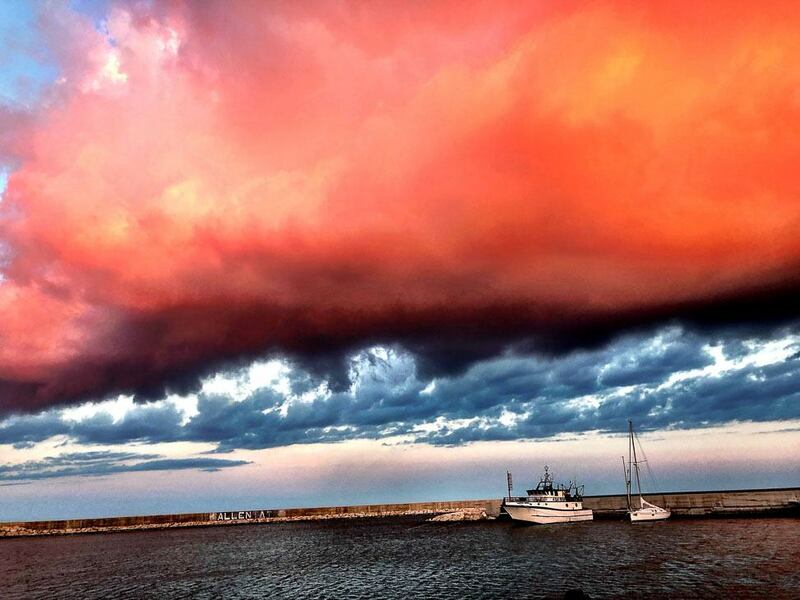 Ah, Puglia! I think this must be where Italians go on their holidays and they have decided to keep rather quiet about it. 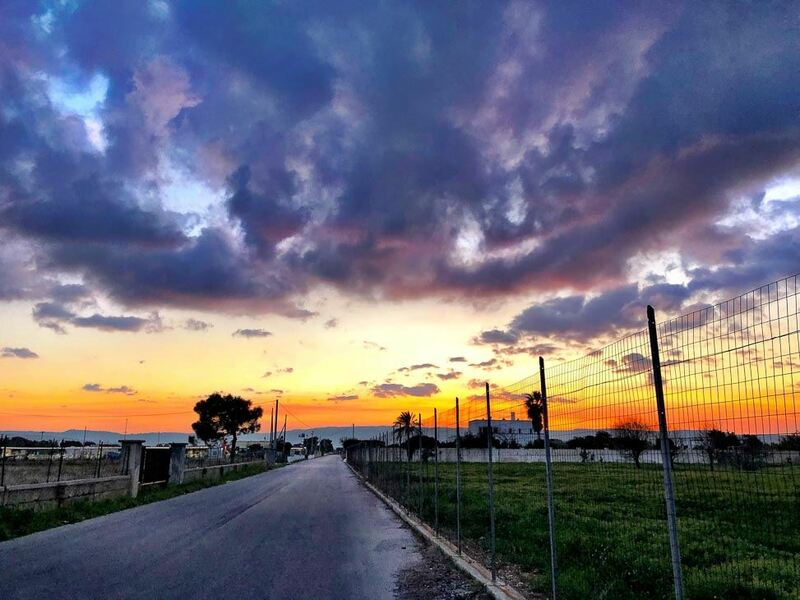 I visited in December for New Year’s Eve – not a typical time to head to southern Europe. It was full of Italians! Rather glamorous Italians may I say! This confirmed my view that the Italians have been trying to keep this lovely area a secret! Well no longer! 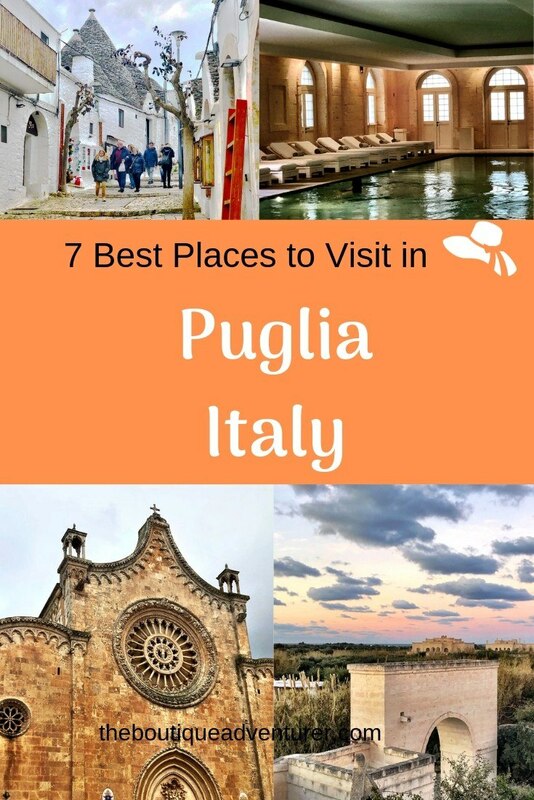 Here are my best places to visit in Puglia. 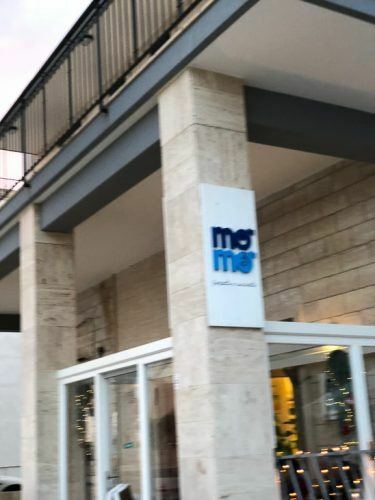 If you’re looking for the best hotel spa in Puliga here it is! 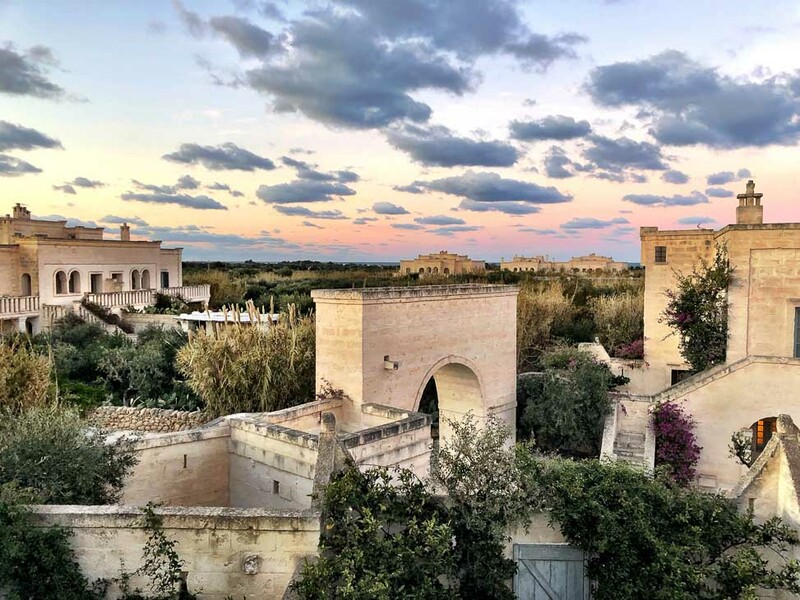 Borgo Egnazia is not cheap – but it’s not ridiculous. I actually think it is amazing value based on my experience. Anyway, I am getting ahead of myself. I visited lovely Borgo Engazia late December for a several nights New Year’s Eve stay. I visited with a girlfriend and had decided I wasn’t going to be a travel blogger – I was just going to relax and enjoy without constantly looking around for content and information. 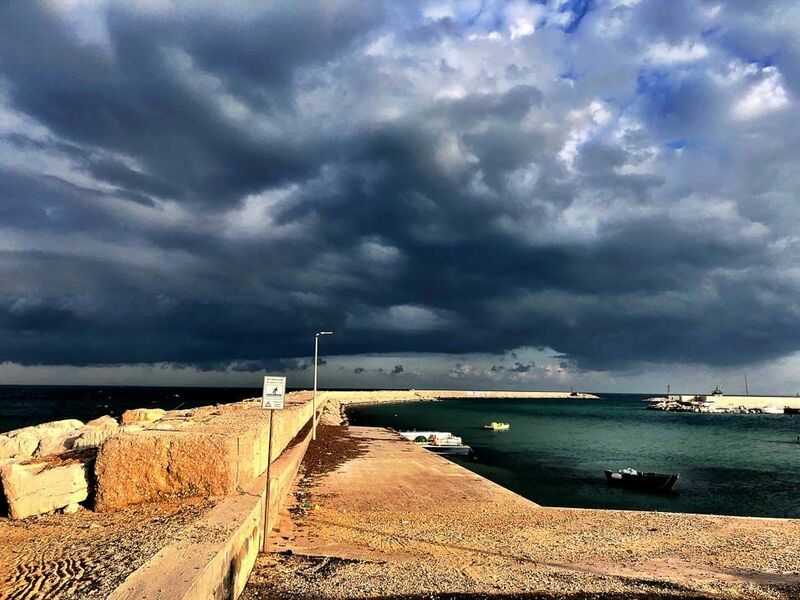 Here I am now writing about it because I so loved Borgo Egnazia and the Puglia region! Anyway, we arrived at night and it was just magical! The entire place was lit up with candles and lights and it was like something out of a movie! I am not sure I have ever stayed anywhere with so many candles! We joked that this must be why they had so many fire doors throughout the place! I imagine someone has a full-time job there as a candle lighter/wax manager – I never saw any stray wax either so this person deserves a pay rise! The resort is more like staying in a village than a hotel of any type. A gorgeous limestone village! This is definitely one of the best places to visit in Puglia. We had decided to get a villa as this was nearly the same price per night as two rooms. I highly recommend doing this. We had a lovely living room area with a little kitchen. The decoration is just stunning. So white and simple yet with so much character. And the lighting – so lovely and warm and most importantly flattering! The living area has a massive tv which is always good news! We were even able to get an HDMI cable from the hotel so we could link the laptop to the tv and watch Netflix – heaven! We were also able to order pizza from room service which was delivered in proper cardboard boxes – and was delicious! There is a small kitchen area. The fridge is a good size and has a nice mix of local products inside. However, there is still room for you to bring in your own wine etc. Most importantly was a very good illy coffee machine – and of course, the coffee was restocked every day because we were in Italy! Our villa had two bedrooms and three bathrooms – not the normal ratio! The downstairs living area had a bathroom with a shower. One bedroom had a double shower and the other a bath and shower. The bedrooms were lovely and also had TVs. Super comfortable beds with a sufficiently high thread count. Good level fluffy large towels and very soft bathrobes. Plus great slippers – more like flip flops than your typical in-room slide style. The villa also had a large ground floor outdoor private area plus a huge roof terrace. Let’s start with breakfast! 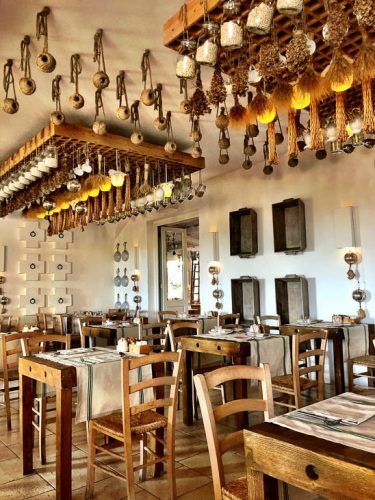 Breakfast is held in the La Frasca restaurant upstairs. There is a large buffet that is very very well stocked! The usual suspects of eggs in different formats, grilled tomatoes, bacon etc. Then lots of local Mediterranean fare including mozzarella, ricotta and burrata cheeses! Some fantastic sweet treats and pastries as well plus fresh juices. It was also possible to order some hot items – omelettes (which were delicious), poached eggs, crepes (which looked amazing) and pancakes which I very much enjoyed! 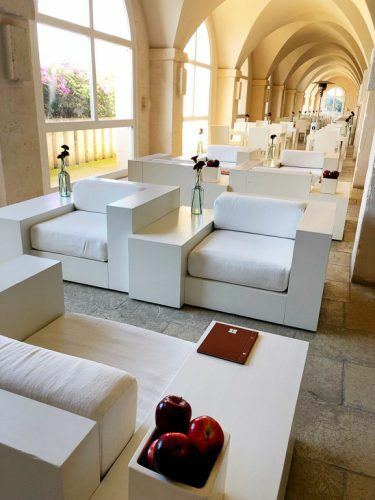 Different lunch activities happen every day at Borgo Egnazia. The weekend brings brunch menus which tend to be at a set price. The main restaurant, Due Camini, is also available for lunch. 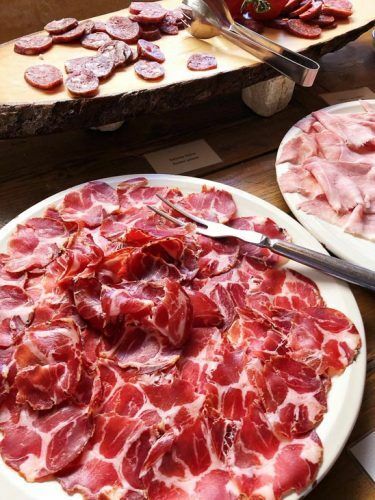 Speaking of Due Camini, it received a Michelin Star in early November 2018! It was easy to see why. We enjoyed a fantastic dinner there. There are some great looking tasting menus on offer but we didn’t feel our appetites were up to that so we enjoyed a la carte again. We both started with a fantastic onion that had been “caved” out and aubergine and ricotta added inside – amazing! The restaurant is so beautiful! 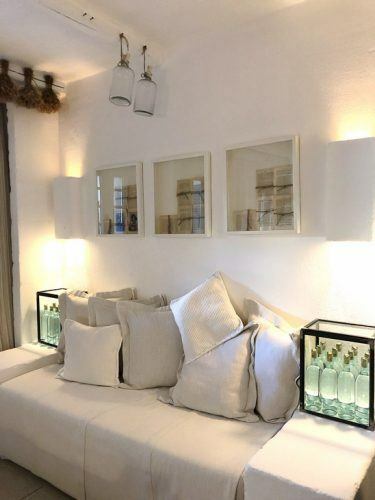 Soft, warm lighting in soft shades of white. I know it is not very Italian but I had pasta as my main meal which was fantastic. After we finished our main meals we were going to head back to the villa. However, the waiter approached and said that he had a special treat for us! Intrigued and excited we followed him to the kitchen – which was suitably impressive! We were taken to a special area of the kitchen and treated to a selection of delicious sweet treats! 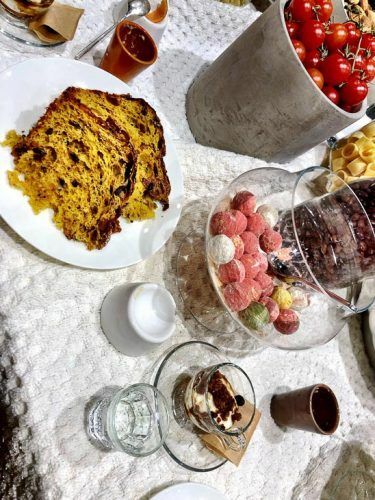 The most amazing strawberry truffles, chocolates and then a very delicious and modern interpretation of tiramisu. The wine list is also extensive! We were delighted to find that several local wines were available by the glass and decided to try different options rather than get a bottle. Oh and don’t miss the very groovy bar for a pre or post drink! 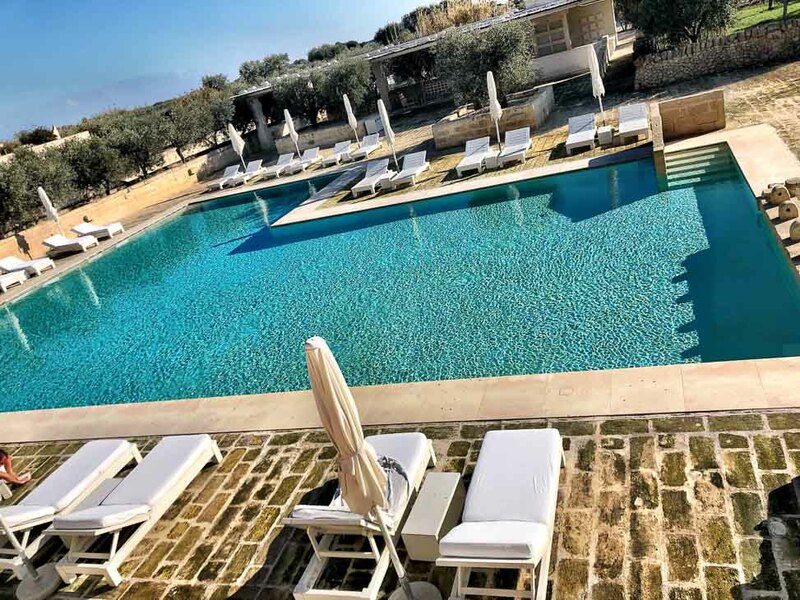 Borgo Egnazia has three rather large pools! I visited in December so the only pool I used was the indoor one where it was nice and warm! It was just actually very pleasant lying on the sun lounger around the indoor pool and reading books! Should you forget anything there is a rather large boutique filled with lovely things. There is a large selection of clothing (men, women and kids), toiletries, jewellery, lots of items sourced from the local area etc. 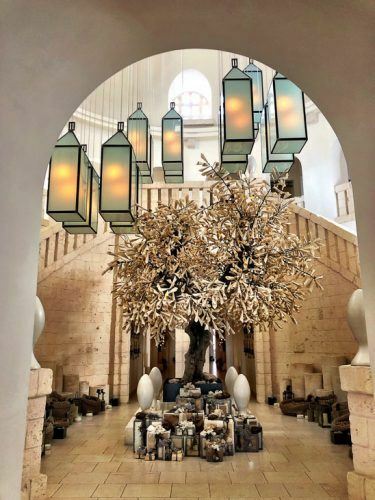 Inside pool at Borgo Egnazia – who needs the sun! Borgo Egnazia also has its own beach club nearby but due to the weather, we didn’t make it there. There is a golf course as well which we didn’t use. We did, however, make use of the many bicycles that are available for use. This area is perfect for cycling as it is rather flat. For further exercise, there is a rather large gym filled with loads of modern equipment. 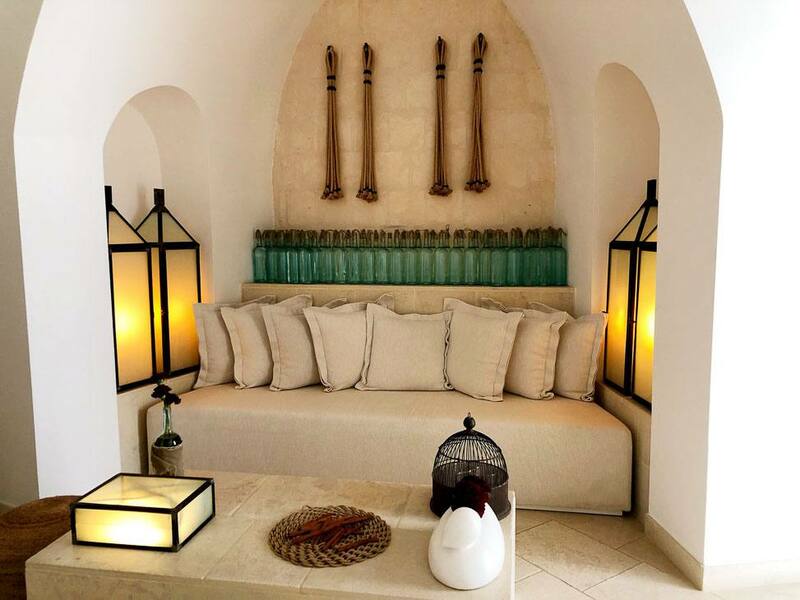 Then, of course, there is the Borgo Egnazia Spa – Vair. 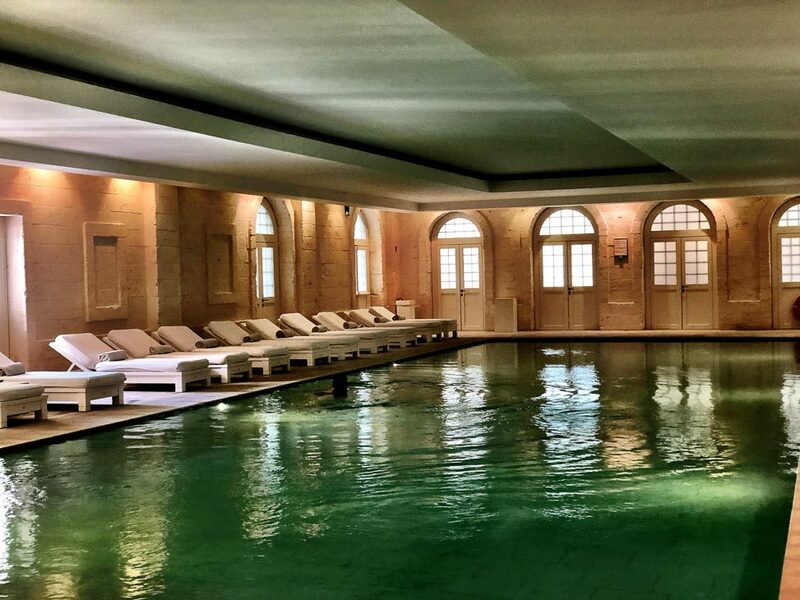 This beautiful spa is located on the lower ground level and is beautiful. There are loads of treatment options and rooms. During my stay, I only used the sauna and steam room in here but the treatment menu was extensive and looked fantastic! The service was just exemplary. Every person was genuinely friendly and immensely helpful. Reception staff were terrific, the waitresses at breakfast were lovely and friendly, the cleaners that came in twice a day – just everyone! We did enjoy our once a day clean and once a day turn down – complete with chocolate dates! On the last morning, I needed to leave by 7 am to get my flight. When I mentioned this reception offered to put together a breakfast box and booked in someone to pick up my bags. Once I got to the front desk my car keys were waiting, Once outside the car was there and my case had even been put in the boot for me. This type of attention to detail was evident all throughout our lovely stay. It definitely elt like Borgo Egnazia was mostly filled with Italians – which I always think is a good sign! If it doesn’t suit you to stay there I highly recommend coming for at least one meal. This gorgeous white city is set on a hilltop only 8km from the sea. It was raining when we visited but still very cute. It is not easy to find your way around – apparently, the town was built without a plan which makes perfect sense after you have visited! 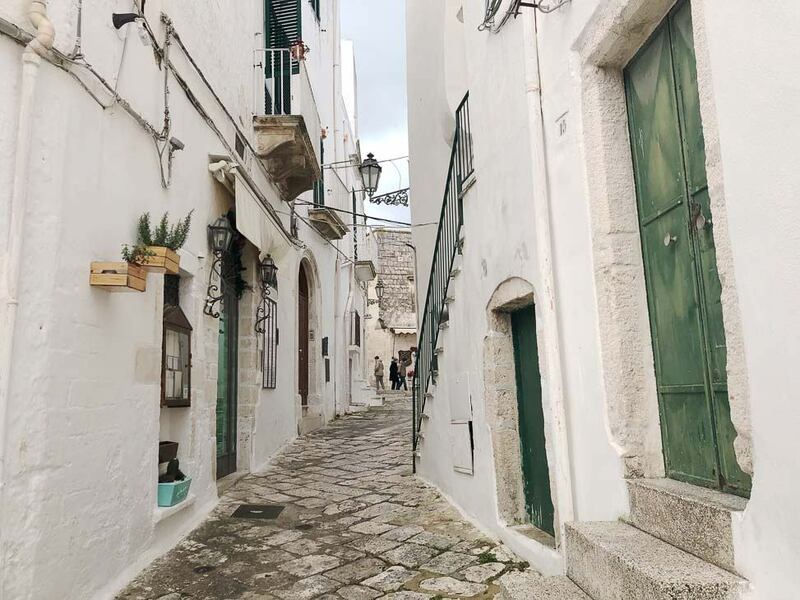 However, like many of these towns, the best thing to do when visiting Ostuni is to just explore and get a bit lost in the back streets. It is a bit of a walk to get to the main part of the old city (right on the top of the hill) but it is worth it. There is a stunning cathedral and then views down to the sea from one side of the old town. It is also extremely instagrammable with lovely arches, cute coloured doors and shutters, white stone streets etc etc. 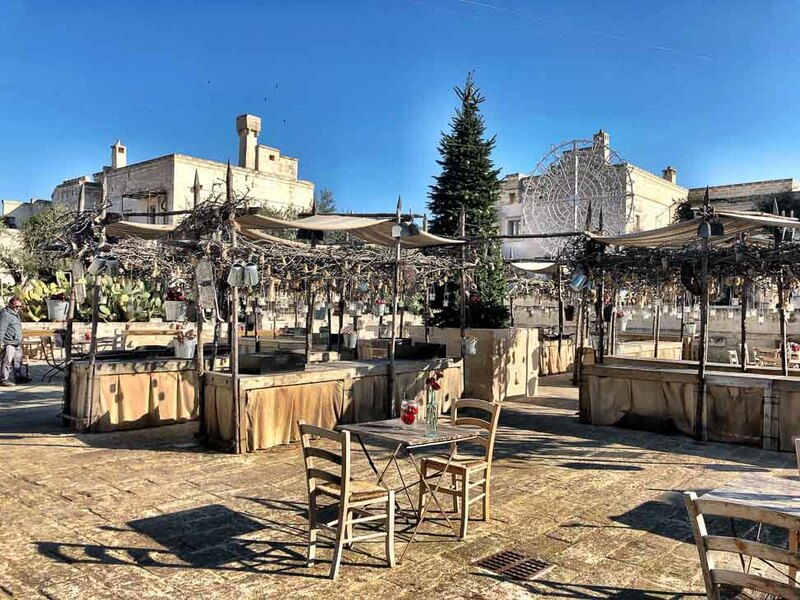 Ostuni is known for its Saturday market. And of course for great places to eat! We stumbled upon Trattoria Fave e Fogghje. This very cute little restaurant is run by two local guys who cook with locally sourced ingredients. Ristorante Porta Nova also has a good reputation. 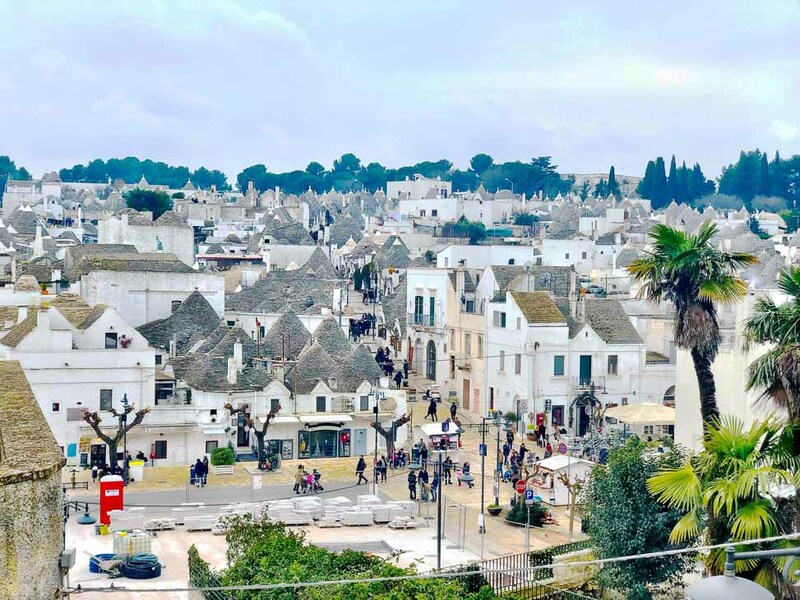 There are so many things to do in Puglia – and lovely Alberobello – which is also very fun to say! – is one of Puglia’s Trulli towns. A Trulli is basically a white stone cottage with a cone-shaped roof. They are a cross between something from early Star Wars and the kind of place you would expect to find in a desert in the middle east! 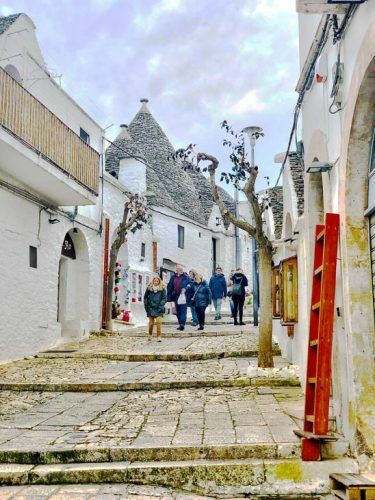 There are 1400 trulli in the old town area of Alberobello. They are mostly located on small cobblestone streets that have been pedestrianised. There are lots of boutiques and shops and restaurants in the trullis. The small town is a UNESCO site. 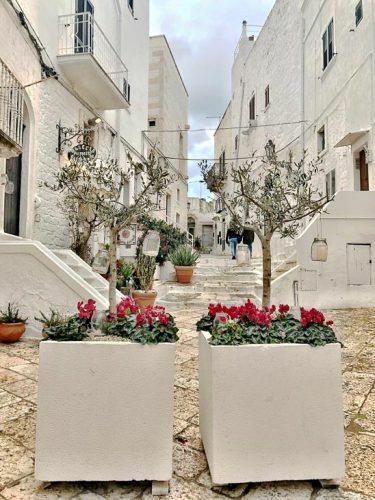 The best thing to do in Alberobello is wandering its cute streets! We followed the signs for the Centro and once we hit the pedestrianised area found the closest place to park. From this point, there was a terrific view of the main square and the trulli section of town – great for photos. 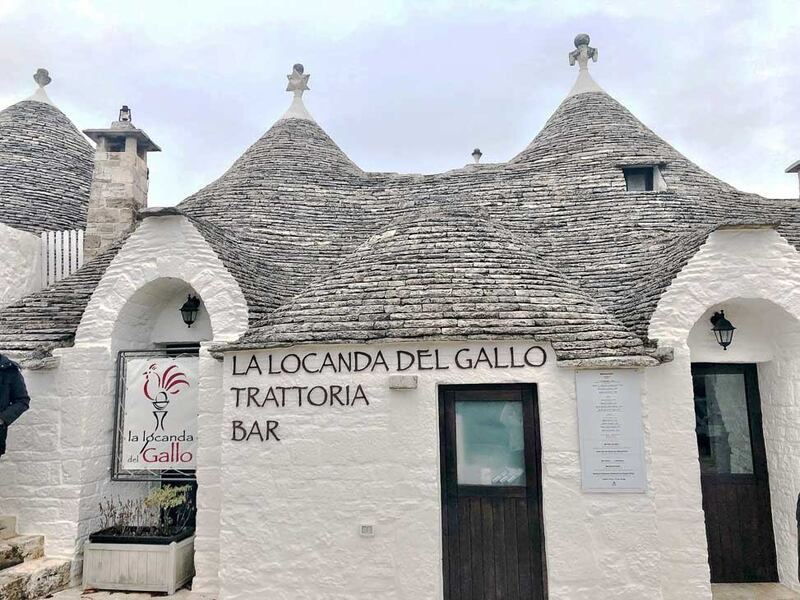 We enjoyed an excellent pasta lunch with local wine at La Locanda Del Gallo. 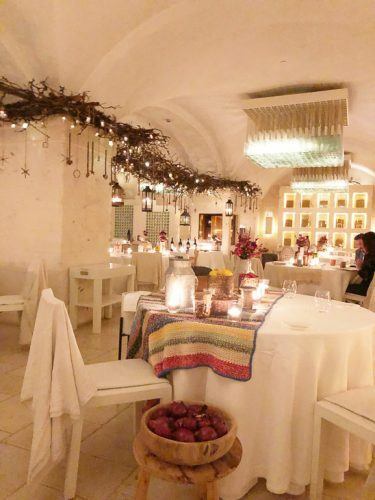 This cute little restaurant was inside a trullo and in the old part of town. I also heard good things about Casa Nova for antipasti. Savelletri is the quintessential seaside town. To be fair there isn’t a lot going on in Savelletri from what I could see. But this is not why Savelletri is on this list. It makes the list for 3 key reasons. The first is its fantastic location right on the sea. It has quite a long boardwalk allowing for lovely strolls. The second thing is the number of fabulous looking seafood restaurants dotted along this lengthy area. 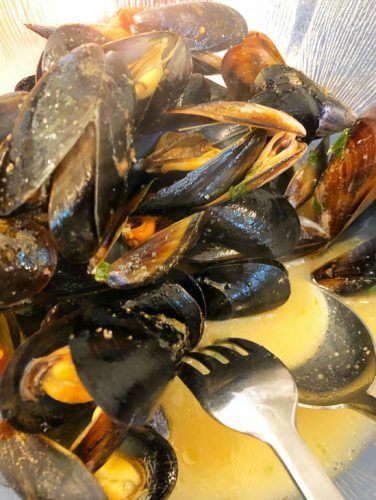 Pasta plus great seafood – heaven! We visited little Momo which was a bit away from the main drag. It is a tiny restaurant – there are probably about six tables inside. I assume they have loads of outdoor tables when the weather is better! The food was great. We were practically sitting in the kitchen so got to see the food being prepared up close and personal! Everything looked very fresh and local. We hugely enjoyed a seafood salad and mussels. Plus local wine of course. Momo had quite a few organic wines as well which were nice to try. Number three – the sunsets. Wow wow wow!!!! I hope my photos in this post speak for themselves. I saw the most amazing pink clouds during the sunset I witnessed. Also, importantly there were some nice buildings, sea frontage and palm trees for the foreground of the sunset shots – absolutely critical for a good sunset photo! If you are staying at the lovely Borgo Egnazia grab one of their bikes and you will be in Savelletri in ten minutes. So Bari is a bit of an odd one. It is not the cute and atmospheric small Italian town that generally feature in this area as key for tourists. It is the real thing. A bit of a rough and tumble town. A genuine southern Italian town. And it is quite free from tourists so a nice difference. There is a quite nice seaside area with restaurants but the rest of Bari is a bit rundown. What I most enjoyed about Bari was the people. The real people that lived in the town. Walking through the town windows are open with washing coming out. Old women are yelling down to the street. Cats are prowling. Big issues are being discussed intensely over coffee. This is Italy so of course, the food and wine are great in the large majority of places where you eat. Come to Bari for a day as a bit of contrast to the extremely picturesque Italy in the other towns in this list. 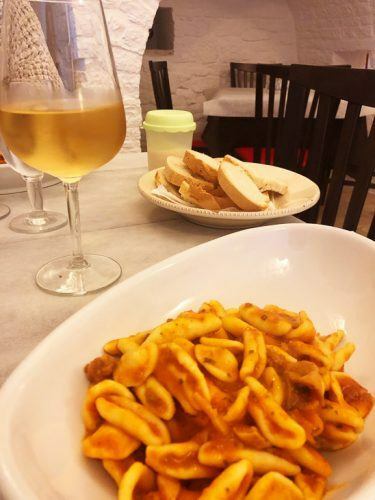 It can also serve as a great base if you are keen to visit lots of the different parts of Puglia without having to change hotels every night. Get underneath the skin of this city with a Bari Street Food Walking Tour or a Home Made Panzerotti Cooking Class. Lecce is quite far down south in Puglia and known for it’s over the top architecture. It is larger than Alberobello or Ostuni but still relatively small and manageable. It is also a university town so bubbles with energy. As you may rightly have guessed by now the nicest thing to do in Lecce is to wander! Or orient yourself a bit more with a map from the tourist information office on the main square. Or why not embrace Italian food? 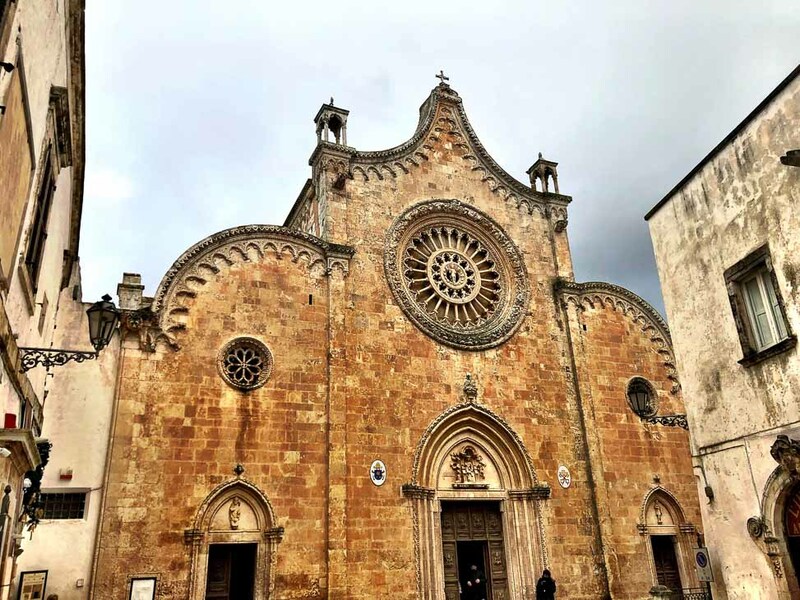 Check out this great value Lecce Wine and Food Tasting Tour. Or this Street Food Tour of Lecce with Wine Tasting. Or this Traditional Home Cooking Experience? Strictly speaking, Matera is not in Puglia but it works well as a day trip from the region so I thought I would add it in. I have to be honest, I didn’t get there on this trip but I had researched it. This gorgeous little cave town has been named The European Capital for Culture for 2019 so it is getting busy! Cities like Matera are often perfect for a tour – particularly if they are focussed around food! To fully discover the backstreets of Matera check tout this Matera 2 hour walking tour. Or how about a Traditional Hands-on Cooking Class in Matera? Find out more here in this great post from the Never Ending Voyage on Matera. Puglia has two main airports: Bari and Brindisi. Confusingly the airport code for Bari is BRI and Brindisi is BDS! Brindisi is the more southern option and both cities are near the coast. Alas, Ryan Air offers some of the best options in terms of direct flights and prices. I took Al Italia one way as I couldn’t face Ryan Air both ways. It was kind of annoying to stop in Milan but I was able to land at City Airport in London so total travel time was virtually the same as going to Stansted. I highly recommend renting a car when in the area. Although it is still Italy, driving here is not quite as scary as in other parts of Italy! It is quite easy to get around. 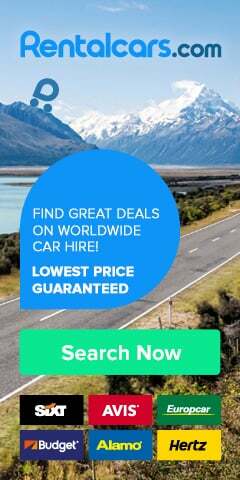 Click here for cheap car rental deals in Puglia. If you click through on the links in this blog post and make a purchase I will make a small commission. Just wanted to make sure that you knew. I think the Italians are keeping this area secret! 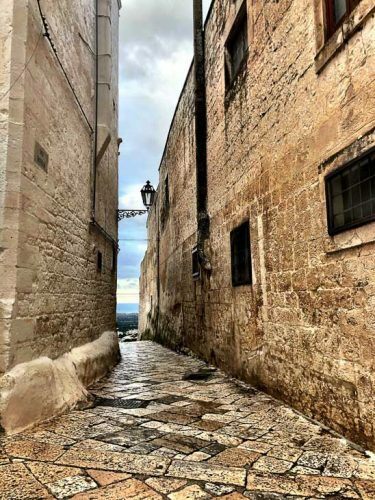 Let’s all ruin it for them – here are my 7 Best Places to Visit in Puglia – from Alberobello to Ostuni to Bari and more! Airbnb Is Accused Of Destroying Cities. This Company Says It’s The Ethical Alternative.